In summer 2018, Chester Zoo hosted Wild Worlds, a festival like no other. In collaboration with incredibly talented artists, landscape designers, scientists and entertainers, the Zoo created a series of inspiring spaces that celebrated the natural world. These amazing spaces showcased the very best of the Horticulture and Botany team’s skills, as well as demonstrating the Zoo’s passion for conservation. The primary purpose of Wild Worlds was to increase visitor numbers between June and September 2018. To achieve this, the Zoo chose to focus on developing engaging and entertaining ways of connecting visitors to the natural world around them, by creating unique and different spaces that visitors could wander through, explore and experience. In order to promote the fun events being held throughout the season and keep audiences engaged in the inspiring ideas of the campaign, Chester Zoo needed our help to create a compelling Wild Worlds microsite that could host a wide variety of content. From the Wild Worlds website, Chester Zoo wanted people to either purchase tickets from the booking page or enter their details for regular updates. To comply with GDPR we needed to ensure that any data-capture forms adhered to Chester Zoo’s own policies and system, as well as being intuitive from the user’s perspective. We took the decision to design the Wild Worlds website mobile first because research indicates that Chester Zoo’s audience primarily view the site on mobile. Mobile first design improves user experience for anyone on the move. Our design of the website used the campaign creative, supplied by the client, which is in a beautiful papercraft style. We were keen to ensure that the passion and bold colour of the Wild Worlds festival was clearly evident. We’ve created a site that invites you to look closer, deeper and almost touch. 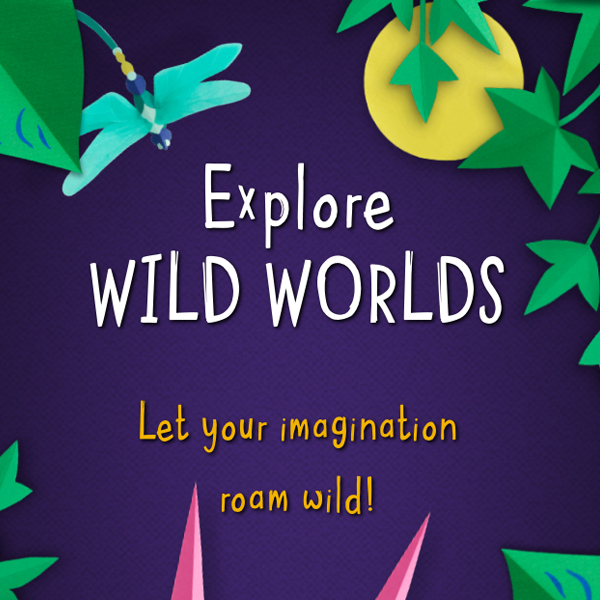 To further help bring Wild Worlds to life online, we used subtle animations that catch the eye. On desktop, the hover animations have the additional benefit of helping with user experience. It gives the user a clear sign that the button or content that they’re hovering on is clickable. The Wild Worlds festival encourages visitors to learn about the natural world in unique, interesting ways. To bring this sense of wonder to the microsite, we created an animated interactive soundboard. Users can listen to the different sounds of nature and click through to learn more about the creatures or plants they hear. Given Wild Worlds is an event-based festival, it was important that users could easily find all the relevant information. Through our event listing filter, users could choose to browse either by day or event type, depending on whether they’d already picked a specific date to visit Chester Zoo. Similarly, we gave users of the ‘World of Discovery’ blog the ability to filter what they see by the different styles of content. Everything can be shared via social media, and Instagram posts tagged #WildWorldsatCZ are pulled through to an image feed on the site. To ensure that the website content was relevant to the different target audiences, we created an SEO keyword strategy and content plan. With this knowledge, we could ensure that the Wild Worlds site provided that information and so ranked higher in search engine results, increasing the likelihood of people clicking through to the site. Working closely with the Zoo’s internal marketing team we can ensure that the content they are publishing and providing is relevant for their different audiences.